The election of Barack Obama, an African American liberal with a Muslim middle name, will be remembered for generations as a historic moment in American history. Made possible by the financial crisis and economic recession, President-elect Obama will enter the White House in January of next year with a mandate to take bold action to revive the global economy and put American on the path to economic greatness. It's hard to believe today, but back in early September, it looked like Barack Obama would lose. Senator John McCain was pulling away in national tracking polls as the chant, "Drill, Baby, Drill!" echoed across the nation. Record high gas prices were the top issue of the campaign, and as Republicans' united around a clear, powerful (yet disingenuous) call for expanded oil drilling, Democrats, including Obama, fumbled for a response. But with the collapse of Lehman Brothers and the subsequent financial meltdown, everything changed. As the economic crisis spread panic and Americans looked beyond the current inhabitants of the White House for reassurance and leadership, Barack Obama emerged as the clear choice for the presidency. His calm and assured response to the unfolding crisis strongly contrasted with the McCain campaign's frenetic attempts to capture the political moment, and Americans finally put aside concerns about whether or not Senator Obama was ready for the White House. Over the next weeks, as Americans watched hundreds of billions of taxpayer dollars put on the line to bail out Wall Street banks that weren't lending , they prepared for the inevitable worsening of conditions on Main Street. And they listened intently as Barack Obama found his closing argument: in speech after speech and ad after ad in the final week of the election, Senator Obama told Americans it was time to create "an economy that rewards work, creates jobs, and fuels prosperity from the bottom up." In short, he made the case that the time has come to invest in the long-term prosperity of Main Street America. credit." .... A new economic turbocharger is going to have to be found, and "there is no better potential driver that pervades all aspects of our economy than a new energy economy..."
Obama sees great potential in an Apollo-type energy project. Invest in a new energy system that will provide economic growth, increase national and economic security by reducing the amount we spend annually on foreign oil and take steps to mitigate climate change. These types of strategic investments could be the hallmark of Obama's domestic policy. The economic crisis means that Obama's policy priorities must be changed to fit the current situation When the exit polls have been totaled, we will see that the economy was the number one issue for voters this year, and that is where Obama has a clear mandate and latitude to approach challenges in bold new ways. And that means it's time for the myopic definition of stimulus that has ruled in the past be left by the wayside. Obama should start from scratch, and look for smart, strategic investments that can solve our short-term woes while creating an economy that's built to last. Given the suite of challenges facing our nation, it's time for investments not giveaways. There is incredible potential for Obama to create a new framework for progressive economic policy. This is not the time to replay Clinton-era fiscal conservatism. Shrinking the deficit and cutting off spending will only worsen the coming recession. Nor can we simply recycle the nearly century-old programs of the New Deal. We face new 21st Century challenges that require new thinking and new solutions, and it's time to let go of old dogmas and philosophies and start from scratch. It's time to leave behind the dogged commitment to PAYGO. Taxing one sector of the economy and spending it elsewhere does not stimulate the economy, and unlike 1993, when Clinton committed to buying down the deficit, the economy is entering a period of stagnation. If progressives want to be the party that creates broad based prosperity, they must embrace deficit spending, not new taxes on the middle class, until America is out of recession. This hands-on economic approach should also be applied to other policy areas. It is high time to leave behind the dogma that the only role for government is to cut rebate checks and set carbon prices. 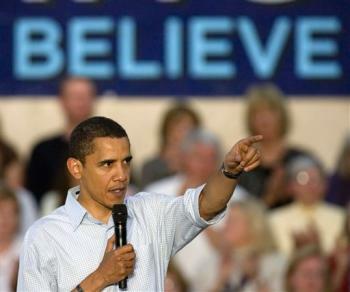 Paradoxically, the economic crisis that Obama will inherit when he is sworn in on January 20th will carry many opportunities. Strategic investments and expansive problem solving in Obama's first one hundred days could establish a positive character and broad role for progressives in governance well into the twenty-first century.